You know you have a problem when people ask why you are repeatedly sporting the same nail colour. It's not a secret that I love Essie polishes and until I discovered L'Oreal polishes which I talked about here, Essie was the one and only brand I ever bought so you can imagine I have quite the collection. But there is one I shade I always go back and today I want to dedicate this entire (albeit short) post to it. Despite offering a few miss shades, I generally find Essie polishes to be long lasting and I can wear some shades for about a week chip-free. And it is not any different with this gorgeous coral red colour, Fifth Avenue. I love all things red, and yes this polish is very bright, but it is also elegant and classy and if I may so, I think it looks really nice on my pale skin. Fifth Avenue has been featured many times here on the blog and what can I say, I have yet to find a true red shade as gorgeous as this that works well for any season. Clearly a year round classic and one I gladly wear any time, nothing beats a coral red for a chic mani and, with the likes of Olivia Palermo wearing this on repeat too, you know you are doing something right. Not only is this a key shade in your nail repertoire, coral red works fabulously with tanned skin (hello summer holidays soon in Algarve) and with just enough of an orange undertone to it, this is a colour that flatters every skin tone (no matter how pale you are because have you seen how white I am?!). 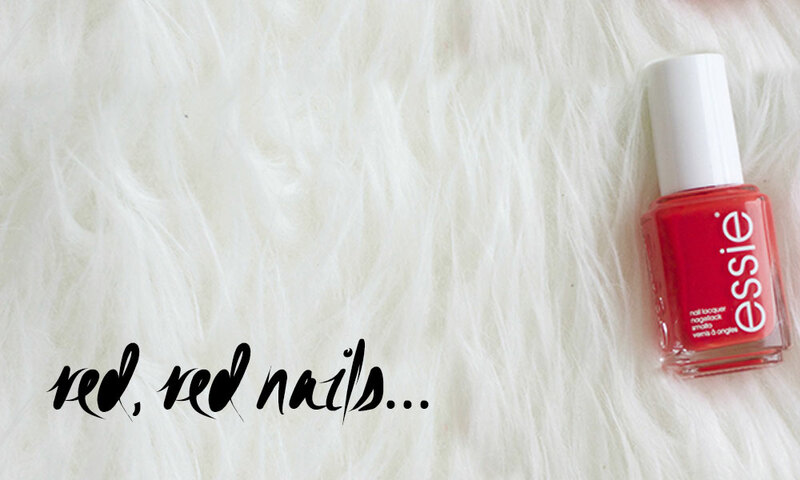 Bright red nails aren't for everyone but if you ever want to try red, I recommend this 100%. Whilst it may not be the cheapest offering on the high street, retailing at £7.99 at Boots (although sometimes cheaper on other websites), this season I am betting on striking red nails and this stylish and creamy red orange blend lacquer does just the trick. This is one shade I will gladly be adding to my travel make-up bag. Imagine this on a beach, on one hand my sunglasses and on the other a cocktail...yes please! Tell me, do you own Fifth Avenue? What is your ultimate summer shade? Let me know below! Cor linda, tenha uma semana abençoada. I love a good red polish!! Oooo, that looks like a stunning red, Pam and I'll need to check it out. I have problems with reds on my nails, they usually age my hands and just don't look right on me. Maybe this will be the perfect red? Fingers crossed. I love this shade! Great choice, Pam! Love the colour on you. Essie is a very good brand. The shade looks so pretty, but unfortunately Essie nail polishes chip so fast on my nails! I've never tried this shade before but i can see why you love it! Essie do the best range of shades! Beautiful shade of red, Pam. I am not sure, but I don't think I have this particular one in my collection, yet ;) Happy new week, hun. Love that fire-y color! I have been on the opposite end of the spectrum with color, but still Essie! I've been wearing "Mint Candy Apple" non-stop this summer! Such a lovely color! I have to try some nail polishes from this brand. The color is gorgeous! No wonder why you repeat it ;) I'm a sucker for red mani, too. I think I got that from my mum, she always wears red or burgundy nail polishes. :) I'd definitely try this coral red, it looks so summery! Lovely and classic colour. Maybe I will try this one. I have Essie Russian Roulette and don't like it at all, even with three coats it was super thin and not opaque. I'll follow you on snapchat girl ! I definitely think you can get away with brighter shades for the summer, but I have to admit, I don't own a good red! prettiest and nice shade ever. I know what you mean! Great color! Such a lovely shade. Great choice. Thanks for sharing. Great shade! I love wearing red nail polish!